Wow, a real life formula that uses the double angle trig. identities! 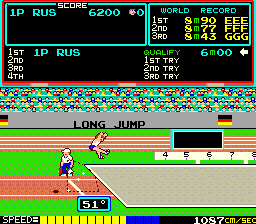 As you can see, the distance a projectile will travel is a function of: velocity, gravity, and the launch angle. First, a quick fraction review: First, recall that is a lot smaller than . Conversely, we can also agree that is a lot smaller than . ie: The bigger the denominator (and/or smaller the numerator), the lower the value of the (positive) fraction. This is a graph of all Sin(x) values from 0 to 360. The x-axis is divided into quadrants (0, 90, 180, 270, 360). 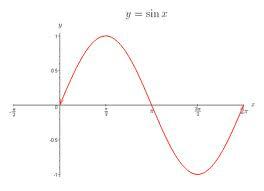 Notice in the graph that Sin(x) rises from 0 to 1 as x rises from 0 to 90 degrees. Then, it drops from 1 back to 0 as x rises from 90 to 180 degrees. Refer back to the double angle in the original formula up top. So, as x rises from 0 to 45 degrees, 2x actually rises from 0 to 90, and the value is increasing. But, as x continues to rise from 45 to 90 degrees, 2x rises from 90 to 180, which means the value is now decreasing. So, what’s the ideal angle to throw something? The one that maximizes the value of , since it’s a multiplier in the projectile formula. Well, as you can see in the graph, Sin(90) = 1, the highest possible value for Sin(x). So, the ideal launch degree is x = 45 (which puts 2x at 90).